Did a post in 2014 in the same historic fact. 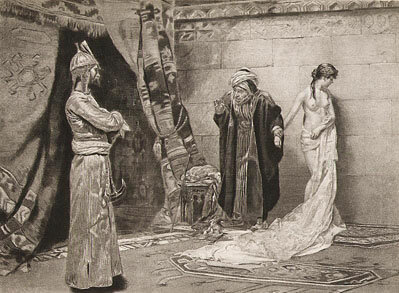 Robert C. Davis notes in this eye-opening account of Barbary Coast slavery, American historians have studied every aspect of enslavement of Africans by whites but have largely ignored enslavement of whites by North Africans. 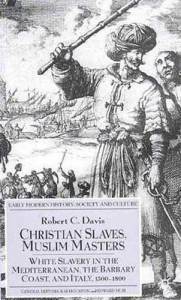 Christian Slaves, Muslim Masters is a carefully researched, clearly written account of what Prof. Davis calls “the other slavery,” which flourished during approximately the same period as the trans-Atlantic trade, and which devastated hundreds of European coastal communities. Did you know that No One Sailed from the U.S. to capture the African Natives? History book – The Decline of Eastern Christianity Under Islam. “From the Halls of Montezuma to the Shores of Tripoli“. The Marines under President Jefferson were ordered to stop the Barbary Pirates. Jefferson even got a Quran to learn about the Muslims who were the responsible pirates in the Mediteranian Sea. (Marine First Lieutenant Presley O’Bannon was awarded the “Maremaluke Sword” by the Ottoman Empire viceroy, Prince Hamet, on December 8, 1805, during the First Barbary War, in Libya, as a gesture of respect and praise for the Marines’ actions at the Battle of Derna (1805).) That Sword is part of Marine tradition and is carried by the officers today. Only the Marine Corps teaches that part of American history. With all the noise in the media about African Slaves it is never mentioned about the Americans that were slaves at that time. I suggest reading Brian Kilmeade’s book “Thomas Jefferson and the Tripoli Pirates”. Censored Cal Thomas article from the Tribune Evening News. Everyrthing in red was intentionally cut to change the flavor of the original article! “West took to the floor of the House last week to praise what he called the Republican Party’s contributions to civil rights. It is a history practically unknown among many African Americans, who have been taught that Republicans are racist and care nothing about black empowerment. When examples to the contrary are presented to them, they often call white Republicans disparaging names and vilify Black Republicans as insufficiently black. “West noted that following Republican Abraham Lincoln’s Emancipation Proclamation, Republicans supported the 13th, 14th and 15th Amendments to the Constitution, which ended slavery, provided for equal protection under the law and gave voting rights to blacks. “Republican George W. Bush, West said, “signed an omnibus bill that included a voucher program for school children…,” establishing school choice in Washington, D.C. President Barack Obama announced there would be no new funding for the program in his current budget, even though it’s enormously popular with poor African-American parents, who see school choice as fundamental to their child’s success. Apparently, the president favors teachers’ unions over poor schoolchildren. More history: The Ku Klux Klan was founded by a group of Southern Democrats; white Democratic politicians in the South tried to derail civil rights legislation; white Alabama Governor George C. Wallace stood in a schoolhouse door to keep African-American students out; the late West Virginia Democratic Senator Robert Byrd was a former member of the KKK. Byrd eventually recanted his racist beliefs, but late in life still used the phrase “white n—-r” in an interview. West’s point <changed to ‘contention’ is that those Democrats who claim to care so much for African Americans have done them a disservice by perpetuating the myth of Republican racism and addicting too many of them to a government check instead of liberating them through education and strong families." Of course, African Americans are not the only group represented in this number — there are poor Hispanics, poor whites, etc. And certainly not all vote Democratic. The fact is, more and more Americans are finding themselves relying on government. In many cases, they would work if there was work to be had; they would succeed if the road to success were a viable option. The question for African Americans, however, particularly during Black History Month, is not about history at all. The question is: “Are better you off than you were 40 years ago?” By any objective measure, the answer for too many is “no.” That was West’s point. No wonder the liberal establishment wants to redistrict him out of Congress." PROPAGANDA is not new. They have been rewriting our history from the start of government indoctrination centers (schools funded by federal (taxpayer) $$).